Spring is here.....and finally I have sprung into action to write the first newsletter for Your Aromatherapy Guide! I have been doing a little spring cleaning around the house and decided it was actually quite a mentally uplifting and invigorating experience. It probably helped that the essential oils I was using - lemon, lavender and rosemary - all have these properties. So I have decided to highlight a couple of essential oils that will help to get rid of those winter blues and put a spring in your step - one familiar and one a little more unusual. 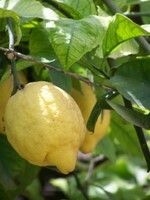 Lively, fresh, zesty and a powerhouse full of health properties - the humble lemon. This is a great essential oil for cleaning and deodorising your house, so fantastic for spring cleaning..........and you get the added bonus of the fabulous zingy aroma. Put a few drops on a cloth and add to your washing as it goes into the machine......mmmmmm, everything smells lovely and clean and fresh! Read more about lemon essential oil here. A lesser known oil, but one which I absolutely adore..........and I am sure you will when you experience it! It is slightly evocative of frankincense with hints of lemon - perhaps this is why I love it so much. Elemi is harmonising, calming and a great essential oil for lifting your spirits. Why not put a few drops in a diffuser if you are feeling emotionally fraught or stressed.......you will soon feel yourself starting to calm down. Read more about elemi essential oil here. So how can you actually use these oils to help uplift yourself? Put a couple of drops onto a tissue, close your eyes and inhale deeply - feel yourself relaxing. Use a few drops in your bath - don't forget to mix it with a little milk first, to help it disperse. Place a few drops in a diffuser and enjoy! Fill a spray plant bottle with distilled water and add about 10 drops of essential oil for every 300ml of water. Spray finely into the air around you whenever you feel the need to be uplifted. Put 4 to 5 drops of essential oil on a cotton wool ball and tuck behind a warm radiator. Please don't hesitate to contact me if you have any questions or any ideas for a future newsletter.